Spring. Not a moment too soon. I’m dreaming of fresh cheese and fava beans, those first-of-the-season moist favas that hardly need cooking. I slather the cheese on toast, with the favas folded into the cheese or on top. Herbs of choice. As long as favas are in season, this is the go-to app at my house. (Asparagus works, too). The recipe is from my beautiful new book, Wine Country Table. I typically use whole-milk ricotta, but you could substitute fromage blanc, fresh goat or sheep cheese, cottage cheese or lebneh (yogurt cheese). Sometimes I use feta whipped smooth in a food processor with a bit of olive oil. 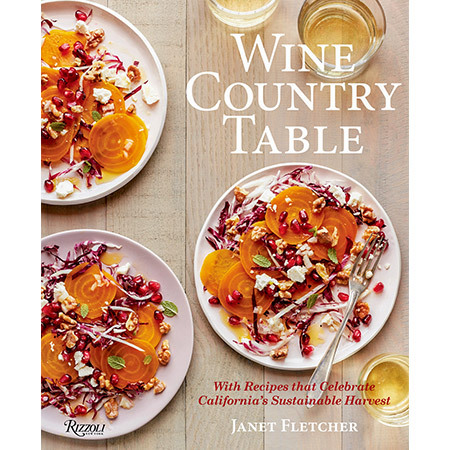 Wine Country Table: With Recipes that Celebrate California’s Sustainable Harvest (Rizzoli) is a showcase for California farms and wineries that are leaders in sustainability. I spent several months traveling from one end of the state to the other, visiting progressive growers of pears, avocados, olives, asparagus and other California crops. I met and profiled vintners who are cutting-edge in their sustainable practices. It was eye opening to learn about these leaders who are reshaping agriculture in my state. Accompanying their stories and my recipes are breathtaking images from Sara Remington and Robert Holmes. We all know California is beautiful, but these two have a talent for helping you see with fresh eyes. I’ll be doing a number of cooking classes, talks and signings to celebrate the book’s publication. Please check my calendar. For an autographed copy and free shipping, you can order the book from me. You can also order from Rizzoli, Amazon, Barnes & Noble or your favorite independent bookseller. Note: Jordan Winery has consented to the use of the title Wine Country Table for the book. Find food, wine, entertaining and travel tips at www.winecountrytable.com. This recipe was inspired by the bruschetta at Bruschetteria, a kelly-green food truck in St. Helena, California. 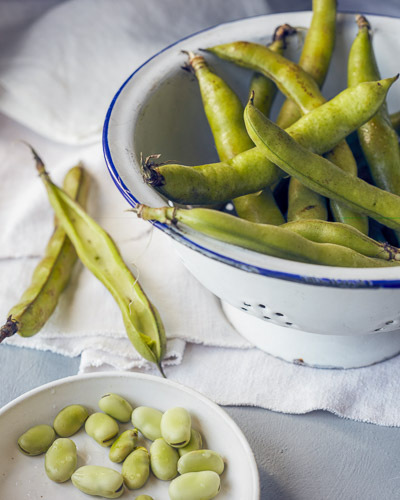 When fava beans are unavailable, you can substitute ½ cup shelled peas, fresh or frozen, or slender asparagus tips. Remove the fava beans from their fuzzy pods. Bring a small pot of water to a boil over high heat; have ready a bowl of ice water. Plunge the fava beans into the boiling water, return to a boil, and cook until they are tender—about 1 minute if small; 2 minutes if large. (Test a few to be sure.) Drain in a sieve and immediately transfer to the ice water. When cool, drain again and peel. Put the fava beans in a small food processor and pulse until coarsely chopped; do not puree. (Alternatively, you can chop them with a knife.) Transfer to a mixing bowl and fold in the ricotta, pecorino, 1 teaspoon olive oil, green onion, and lemon zest. Add garlic a little at a time, tasting as you go; you may not want it all. Season to taste with salt and several grinds of black pepper. Taste and add more lemon zest if desired. The mixture should have a lively lemon taste. Toast or grill the bread on both sides; the center should remain soft. Using the remaining 2 tablespoons olive oil, brush both sides of each toast with oil. Transfer the toasts to a work surface. Top with the ricotta spread, dividing it evenly. Drizzle with additional olive oil. Garnish with torn mint leaves. Serve immediately.